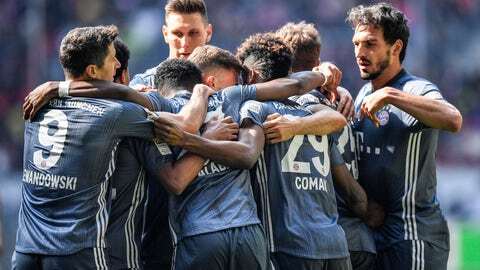 Duesseldorf, which grabbed a 3-3 draw in Munich earlier in the season, had its Bundesliga survival confirmed on Saturday thanks to relegation-rival Stuttgart’s defeat to Bayer Leverkusen and was effectively only playing for pride. Dodi Lukebakio claimed Duesseldorf’s consolation from the penalty spot in the 89th, and there was still time for Goretzka to score in injury time. Augsburg defeated Eintracht Frankfurt 3-1 away in Martin Schmidt’s debut as coach, dealing the home side its first league loss of the year and putting a dent in its Champions League aspirations. Frankfurt, which had Evan N’Dicka sent off early in its 4-2 loss at Benfica in the Europa League on Thursday, was again reduced to 10 men after captain Gelson Fernandes was sent off with his second yellow card after the break. Augsburg was already 2-1 up at that stage and Michael Gregoritsch confirmed the visitors’ win late on. Hoffenheim defeated Hertha Berlin 2-0 at home earlier to move sixth — the last place for Europa League qualification. It was Hertha’s fifth consecutive defeat.